When you insert a cartridge into a Nintendo DS, the start menu shows a little image or logo of the game. Homebrew games for the DS can also add their own logos and these show up when you view them in Moonshell or whatever menu your cartridge happens to use. 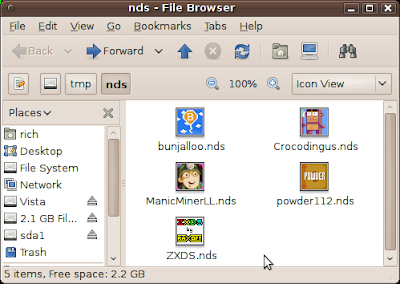 Ages ago I wrote a little script to show these images as the preview icon for NDS files in the Gnome file browser Nautilus. The script is about a hundred lines of Python and it's available here. The setup file in that download tarball associates the icon-extracting command to the MIME-type of the Nintendo DS file. If you use an older distro then you may have to associate the script with the generic application/octet-stream MIME type. The script filters by file name anyway. This association is not done using the usual Nautilus scripting method, where you add a script to ~/.gnome2/nautilus-scripts/, but rather using gconf variables. Oh, and while we're here I recommend you go and play the absolutely brilliant nostalgia-fest that is Manic Miner in the Lost Levels.